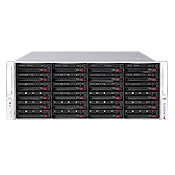 These are our 4U storage servers with Core i3/Xeon E-2100 CPUs. The fixed internal drive can be selected for OS installation, to be separated from the removable drives. When you have more drives selected than what the SAS controller can support directly, please select the SC846E16 or SC847E16 case which comes with SAS expander and external SAS port that can connect to more SAS drive enclosures. The 846 cases have 24 drive bays, while the 847 case has 36 drive bays.